With brand new features.- 1. Plug has guide into socket so it is simple to plug in. 2. Bottom lid locks left to right instead of locking tabs, so dirt doesn't drop back into the pool when you lift it up and bottom lid doesn't drop off of cleaner. Aquatic Distributors proudly brings you the next generation Aquabot Viva(The Most Advanced Remote Control Pool Cleaner) for your inground swimming pool! This state-of-the-art pool machine comes equipped with “Smart Control”, a unique and easily understandable control panel that allows you to customize the Vivas’s speed, climbing prowess, hours of operation, size and shape of the pool, type of deep end, and even when the filter needs cleaning. 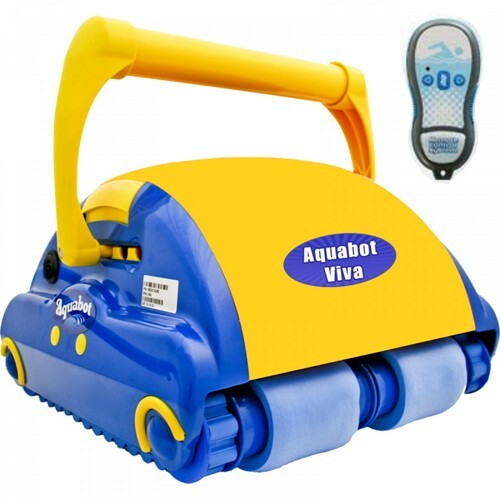 The new Aquabot Viva features a revolutionary RADIO REMOTE CONTROL which gives the Viva the ability to clean any area of the pool at the touch of a button! In addition, the new VIVA employs a very carefully engineered, state-of-the-art Aquacontrol technology allowing communication with the device. This unique control keypad gives the end-user the ability to customize the robot in order to change the program, choose different features, and have complete control of the cleaning parameters. The Aquacontrol is a unique control panel which allows you to communicate directly with the robot and customize it. This Human Machine Interface gives you the option to program different parameters so the pool can always be cleaned as efficiently as possible. Be sure to select each feature to the best of your knowledge in order to get the maximum lifetime out of the robot. If you prefer not to select any features, the robot will work in default mode and choose the parameters for you. • Aquabot Viva computer calculates your pool size and shape and programs itself to completely vacuum bottom and walls up to waterline, unless otherwise specified. • “Smart Control” power supply allows you to customize the operation of the Viva to the pool environment. • Filter bag full sensor immediately senses when bag needs cleaning. • Three cleaning cycles is the perfect way to save energy cost in smaller pools. • Works independently of your pool pump and filter. • Brushes, scrubs and vacuums all at once. • Built Viva tough with four-year warranty to prove it. • Includes a wireless remote control and Caddy Cart for the ultimate in convenience. Cleaning Coverage 8000 sq. ft/hr.